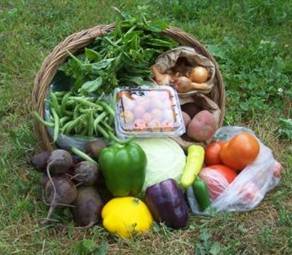 At the Small Family CSA Farm, we plant, nurture and harvest your produce before we pack it in the box and deliver it to your designated drop off point. 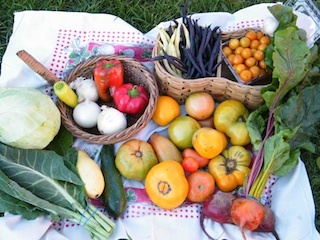 For twenty weeks the Small Family Farm will grow delicious vegetables for you, from the beginning of June through the end of October filled with the Midwest bounty. By being part of a Community Supported Agriculture (CSA) farm, you share the risks and blessings with us through the fate of the unpredictable growing season. While a long, cool, wet Spring may be wonderful for our cool-weather-loving broccoli, cauliflower, lettuce and spinach, it may not be as helpful for heat-loving sweet corn, tomatoes, peppers and eggplants. Here are a few sample boxes depicted below. Keep in mind that no two boxes will ever be the same from week to week or from season to season. 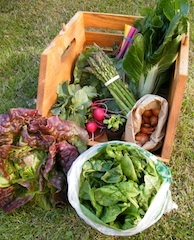 A Weekly box of awesome veggies! 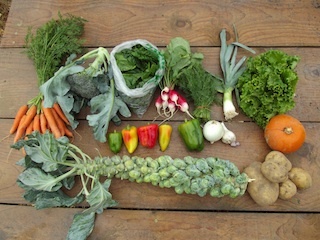 A Weekly Dig Newsletter from the farm offering stories, recipes, pictures and a list of what's in the box! The USDA Certified Organic Lable ~ for your peace of mind. Invitation to 2-3 Farm Events so you can bring your friends and family out to your farm and have an experience here. Delivery to a convenient dropsite in your neighborhood. Option to add on Eggs, Coffee, or Storage Veggie Shares. You don't get to choose what you get, but that's the fun in it! Once the season gets rolling, each box will contain 10-13 different items, likely challenging you with one 'unusual' item like kohlraib or rutabaga.